CSI will be closed for voice communication on Monday, September 5th for the U.S. Labor Day holiday. The CSI host computer will be accessible as usual throughout the holiday weekend, and data from those exchanges that remain open will be available at normal posting times. Sometimes while buying treats for my beagle, I wander past the Betta fish (betta splendens) display in the pet shop. These are colorful fighting fish, the males of which are so disagreeable that they can’t exist in a tank with their own kind. They typically live alone in unnaturally small glass globes, never venturing beyond their very near walls or exerting themselves beyond a tail swish or small foray for a morsel of food. “Beta fish” is the popular nickname of this species, which pet shops sell for display on desks or bookcases. The “Beta fish” is, indeed, a very private pet. Every time I see those “Beta fish” I am struck by how different they are from the “Beta” software we periodically release at CSI. By definition, the “Beta test” version of a program is the public one. The “Alpha test” (named after the first letter of the Greek alphabet) is overseen by sympathetic programmers and staff. Software in the Alpha phase stays in the office and is carefully nurtured, much like the Beta fish. The staff tries hard to extract all the nastiness and render the Alpha software friendlier and, hopefully, harmless before it emerges in the “Beta” phase. The Beta software (the second phase, named after the Greek “B”) is a whole other animal. Residing on the CD ROM with our official release version and available for download from our website, it has legs and wings. Our Beta test software travels around the world where, at best, it ends up in the hands of supportive, but critical customers who will use it with care and report back with details of problems and insightful suggestions. At worst, a new or very exacting customer inadvertently installs it, expecting perfect functionality. That user is likely to be gravely disappointed. This is the truth about Betas. I’m telling you about Betas, the fish and the contrasting software, because we have a new Beta test version (2.9.0) of Unfair Advantage which we think is quite good. It has been used and tested by our programming and technical support staffs, and is now almost ready to go out and meet the world. Rest assured, there will be problems. Beta test versions are notoriously buggy, and we don’t expect this one to be any different. We’re hoping that its users will be patient, honest and direct in evaluating and communicating problems, and in sharing questions and suggestions. As much as we would like to present only perfect products, software companies need Beta test versions to discover those unexpected flukes that occur only in unique circumstances, such as those each of us have on our personal computers. They help us to find quirks that occur when tasks are performed in a certain order or when unexpected combinations are requested. Simply put, Beta testing helps CSI and every other software company speed delivery of good products. What’s in it for the Beta test user? In addition to the satisfaction of doing a good deed, these generous and inquisitive people get to experience our new goodies first and can even have an impact on the way the finished product functions. For example, Beta testing is the only way to get UA version 2.9.0, which teems with new features and upgrades. Check the graphic below to see the look of Unfair Advantage version 2.9.0. It has many of the features recently incorporated in UA version 2.8.3, which most of our subscribers haven’t seen yet because it was in Beta testing until now. Our resident UA programmer has been busy enhancing the UA screen layout in various ways. As you can see, the toolbar icons have been modified for more intuitive selections and the Portfolio Manager panel includes new features for accessing and adjusting your data files. The newly released Unfair Advantage version 2.8.3 and Beta test version 2.9.0 share some common upgrades, including the enhanced Portfolio Manager Panel, quick-pick study selection for charts and the handy “What’s This?” button for quick information. One of the most requested upgrades that is included in both UA 2.8.3 and 2.9.0 is the very extensive quick-pick indicator menu for charting. 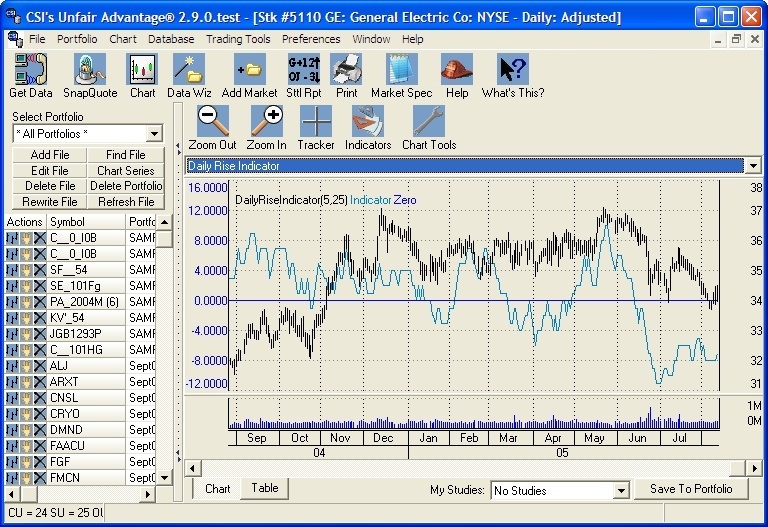 Just click the drop-down menu above your chart to display dozens of analytical tools. Make your choice, and in seconds the study displays on your chart. The full screen shot of UA (below) shows the Daily Rise Indicator created in this way. See the menu below for a glimpse of other possibilities. We’ve also changed the Study Toolbar a bit to function as a fully customized favorites menu, easing the process of adding modified versions of our standard studies and your own user-defined studies. 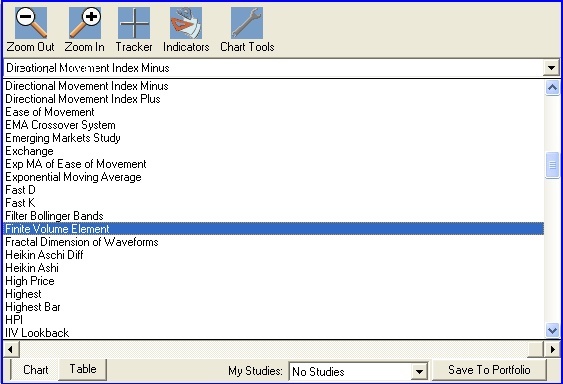 The quick-pick study menu above the UA chart lets you easily select from dozens of analytical tools. On the left side of the Unfair Advantage screen is another feature found in both the new 2.8.3 release and the 2.9.0 Beta test version. You might consider this three features, as each item in the listed portfolio can now be controlled with any of three new control buttons. The first, which looks like a bar chart, allows you to instantly chart the corresponding portfolio item. The second button, which resembles a hand, lets you edit the settings for the corresponding file. The third, an “X,” allows for quick and easy deletions. Although you can still make the Portfolio Manager Panel disappear and use UA’s menuing system for all of these functions, this enhancement offers a visual alternative. One notable addition to the 2.9.0 Beta version is the “Data Wizard.” This is a long-awaited helping hand in selecting markets for charting and portfolios. 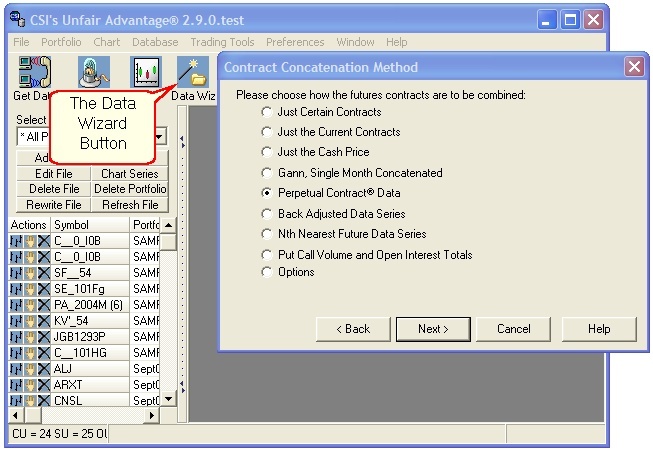 Instead of providing one screen with many user-selected parameters, the Data Wizard provides a single window explaining and soliciting your decisions for each choice. This doesn’t amount to much of an enhancement when dealing with stocks and other uncomplicated data series, but for continuous futures contracts, which might be forward-time-weighted, back-adjusted, open-interest-weighted, etc. etc., this can be a big help. The Data Wizard is accessible via a button on the toolbar (look for the magic wand) as shown below and from the Chart and Portfolio menus. This is one screen of the Unfair Advantage Data Wizard. It simplifies the process of defining files and charts. The Unfair Advantage online manual has been updated to reflect the new features of version 2.8.3, but it will not reflect 2.9.0 changes until they are finalized in the release version. An alternate way to get information about the program is by clicking the new “What’s This?” button at the right end of the toolbar. First click the button and then click the screen image or icon about which you want to learn more. Under development - The CSI Market Index. This study may or may not emerge on CSI software, depending upon our success in adapting it to successfully predict market direction. This CSI Market Index study is incomplete because we are still checking its efficacy and are working on ways of isolating the points of significant movement. That is, when upward momentum from negative territory into positive territory suggests an imminently rising market, and vice versa for falling markets. The trick is to exclude the “too late” signals when the indicator has risen or fallen too far and the neutral situations when a weak movement might trigger a poorly supported trading signal. For our customers who trade options, we’re looking into the creation of a forward options "contract," much like the Perpetual Contract® data we offer for commodities. We anticipate that this will be an excellent tool supporting studies that use implied volatility and statistical volatility to determine whether an option is priced appropriately. There are several promising ways to use an options series that is like our Perpetual Contract data along with technical indicators. A key ingredient in both these new developing products is raw data derived from the CSI options database which includes futures options and stock index options. These series, and thus the resulting market tools, are available exclusively from CSI. Because of the exchanges’ late release of some of the required market information, these studies will need to be calculated after a late download that may be more time-consuming than other updates. You’ll be able to check the online “Posting Status” on CSI’s website to see when you can download the required data. You will be looking for that convenient blue bullet on our website indicating that the options database has been updated. To use the Data Wizard and other new enhancements right away, you must become a user of the Beta test version of Unfair Advantage 2.9.0, which, as explained, is less stable than the current release version. Beta testing is recommended only for those who are experienced with both computers and Unfair Advantage, and for whom an unexpected crash would not be catastrophic. A backup of your old Unfair Advantage is mandatory and a willingness to report problems to CSI is a given. Users of UA v. Beta 2.9.0 currently cannot regress to an earlier version if a problem occurs, which means that a full restoration from your backup or perhaps from a CD will be required. Is Beta testing right for you? Only you can know, but if you think you want to give it a try, please contact our Technical Support Staff for assistance and more information. Our thanks to those who help us by Beta testing our software and to those who patiently wait for enhancements to make it though the process. Each month in this column the CSI Technical Support staff addresses topics of interest to many CSI subscribers. This month they discuss beta test software, a glitch in the index of the new QuickStart manual, our EZDownloader software, delisted stocks, the posting time for stock indexes and the successful completion of CSI’s building maintenance. Q. I installed the Beta Test version of Unfair Advantage from my UA CD and some of the features aren’t working correctly. What should I do? A. You’re doing it! Please report all problems and questions regarding the Beta Test version to technical support as soon as possible. It is important that you include the specifics about when and how a particular problem occurred. Feel free to call or send an e-mail, depending upon the circumstances. Your experience in finding problems with the software is very valuable to us, and will expedite enhanced products from CSI. Thanks! Q. The index of my QuickStart Manual (dated August 2005) seems to be hit-or-miss with regard to page numbers. What’s the problem? A. We just printed a new updated QuickStart Manual but, unfortunately, the software we used to create the index identified the page number of the topic holding the keyword, not necessarily the page number of the keyword itself. We’ll make sure it doesn’t happen in the next printing. In the meantime, if the Index directs you to the wrong page of the QuickStart manual, please scan the next few pages for the information you are seeking. It is surely nearby and within the current topic. Sorry for the inconvenience. Q. I noticed that my computer’s desktop includes an icon that says, “UA EZ Downloader.” What is this, and can I use it? A. The EZDownloader (pronounced “easy downloader”) was developed to support VantagePoint, a third-party analysis program that uses CSI software primarily for data retrieval. It offers a super-simple interface for updating the CSI database and assumes that data management and analysis will be handled either automatically or through a third-party program. Since the EZ Downloader simply collects a day of data, almost any CSI subscriber, including those who use other third-party software, can use this feature for a quick and easy daily update. Software developers interested in simplifying use of their market analysis products are invited to call CSI for assistance in using this feature. Q. 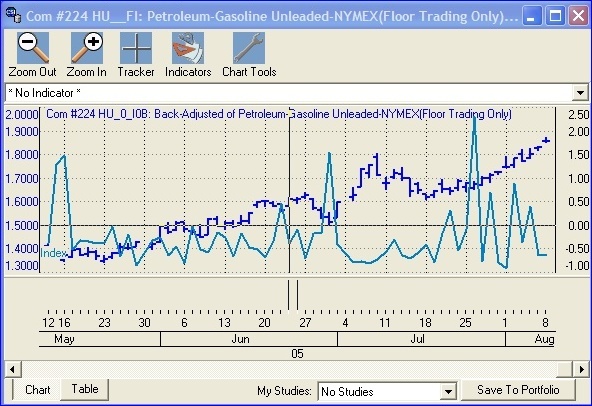 Have you changed the format of the Market Statistics Update in the Technical Journal? I thought it used to include a “Delisted Stocks” report. Also, I don’t seem to be able to find delisted stocks in my database. Please advise. A. Individual investors (Personal and Private Use subscribers) invariably know when their stocks stop trading. We removed the list from our newsletter because it held no value for most of our customers. A delisted stock report is included in the data feed for commercial customers. Anyone who would like to access delisted stocks in the database may do so, but these stocks are offered as a premium service in conjunction with stock updates. The cost is $25 per month with annual prepayment required. If you are interested, please contact our marketing staff to make arrangements. Q. Every day when I look at the closing prices for major stock indexes, e.g., the S&P 500 (SPX-I), the data is one day behind. That is, yesterday’s closes. I want to see today’s values for the indexes with the rest of my stock data. Is this possible? A. Yes. The indexes you refer to are posted in the CSI database on a current-day basis. It seems likely that you are not receiving the current data because you are collecting too early. These indexes are usually ready by around 6:30 p.m., but are not guaranteed to be available until the final data copy around 7:10 p.m. Eastern Time. You can check the posting status on our website before initiating daily updates to see if the indexes have been posted yet. If not, please make a second call after the final copy. By the way, our futures updates have reached a new milestone in early delivery; the complete futures database is typically ready each day at approximately 6:15 p.m. Eastern Time. Quite often, futures data is ready even earlier. Please watch for the Posting Status blue bullet indicator on our website before downloading. Q. Has CSI completed the building maintenance that we were warned might interfere with weekend downloads this summer? A. Yes. The staff pulled all the stops to keep data postings on time and data delivery undisturbed. This was quite a feat considering the computer room and all our offices were inaccessible for about 60 hours one weekend in July. We look at the activity as a trial run of our emergency backup plan that is in place in case of hurricanes. Upgrading to UA version 2.8.3 is free through the CSI website. The Beta test UA 2.9.0 is also free there, as will be an upgrade to this release version when the Beta testing phase is complete. Did you know that 90% of customers needing assistance speak with a service representative on their first attempt to call CSI? We do not use a callback-based support system as practiced by most competitors. Our goal is complete customer satisfaction!